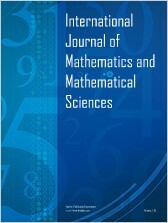 IJMMS - International Journal of Mathematics and Mathematical Sciences is a peer-reviewed, Open Access journal devoted to publication of original research articles as well as review articles, with emphasis on unsolved problems and open questions in mathematics and mathematical sciences. All areas listed on the cover of Mathematical Reviews, such as pure and applied mathematics, mathematical physics, theoretical mechanics, probability and mathematical statistics, and theoretical biology, are included within the scope of the International Journal of Mathematics and Mathematical Sciences. International Journal of Mathematics and Mathematical Sciences is archived in Portico, which provides permanent archiving for electronic scholarly journals, as well as via the LOCKSS initiative. It operates a fully open access publishing model which allows open global access to its published content. This model is supported through Article Processing Charges. The following is a list of the Abstracting and Indexing databases that cover International Journal of Mathematics and Mathematical Sciences published by Hindawi.